If you are looking for a small growing and easy to grow shrub that puts on a fall show with its elaborate color, then Kaleidoscope Abelia is the plant for you. 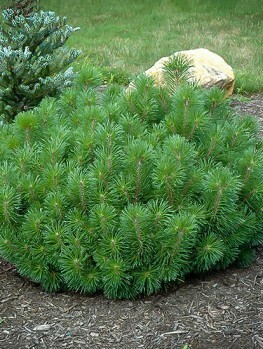 In the warmest locations within its hardiness zones, it performs as an evergreen. However, as its hardiness range starts becoming colder, the shrub performs as a semi-evergreen and in the coldest locations where it’s hardy, a deciduous shrub. A relative in the honeysuckle family, Kaleidoscope Abelia produces graceful, arching branches and clusters of fragrant flowers, making it a welcome and attractive addition to the landscape. Kaleidoscope Abelia grows around 3 feet tall and up to 4 feet wide at maturity. Its name Kaleidoscope tells you everything you need to know about the chameleon-like foliage. During the growing seasons of spring throughout summer, the small, glossy and variegated leaves attached to red stems are mixed with gold, white and green. During fall, the foliage takes on fiery hues of orange and red, bringing eye-catching attention wherever it’s used in the garden. One of the best attributes of Kaleidoscope Abelia is its long lasting and fragrant blooms that arrive in late spring and continue into the fall. Clusters of ¾-inch bell-shaped flowers form at the end of the stems in colors tinged in pink and white. 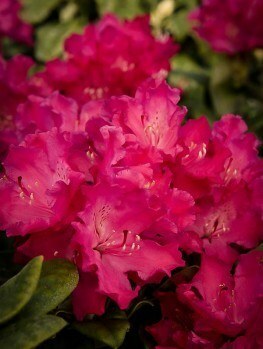 This makes the shrub a perfect choice to plant on a patio or in an area where its sweet aroma can be appreciated. 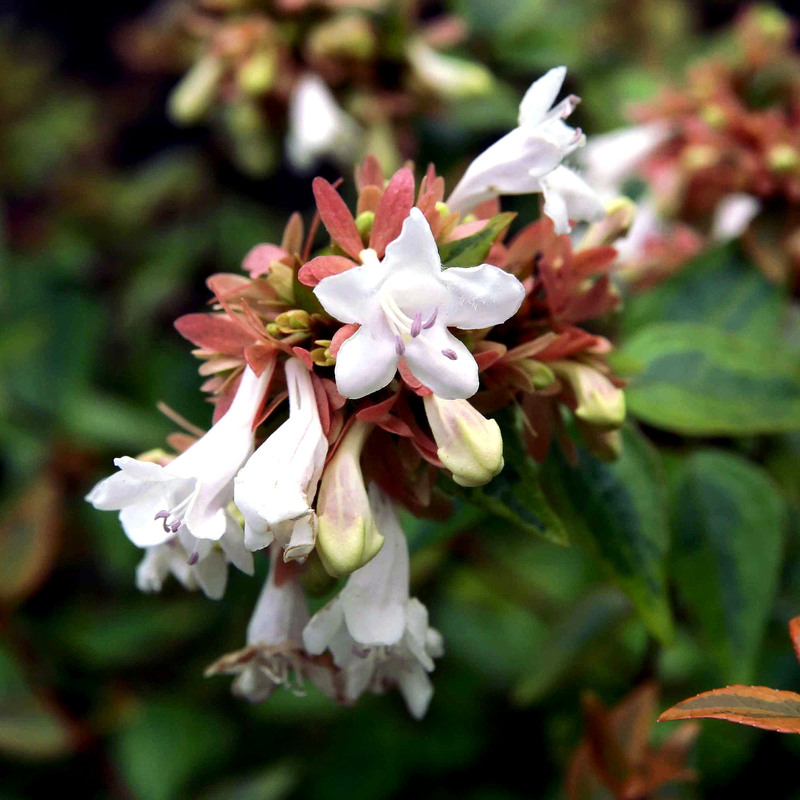 Between Kaleidoscope Abelia’s low-growing habit, hardy nature and low maintenance requirements, it is a good choice for the lazy gardener or for those who feel they kill every plant they touch. It is hardy in a wide variety of climate ranges, and takes the cold as well as the heat and is relatively tolerant to drought conditions. 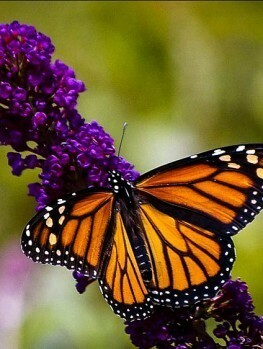 The shrub has no serious problems with diseases or pests, making it not a fussy garden addition. However, those living in the coldest portions of its range can see the shrub die down to the ground during a snow-filled winter when temperatures hit zero, but don’t despair, as it will spring back to life once the warm temperatures of spring arrive. Kaleidoscope Abelia still blooms the following spring, but the shrub may be smaller. If your winters are extremely cold, plant Kaleidoscope Abelia in a protected location and pile mulch up around the base of the plant to help protect the root system. Kaleidoscope Abelia blooms on new wood, so give it a good pruning in late winter or early spring. If your plant died down to the ground or some of the branches died during winter’s cold, wait until early spring to trim off the dead portions, as some sections may seem dead but are still alive. 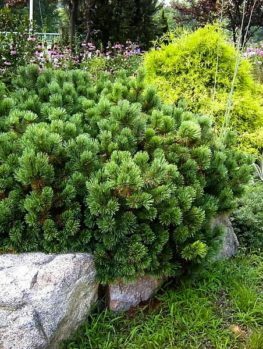 In addition, though its arching branches give the shrub a more natural appearance and flow, you may need to give it a good shearing every three to four years. Although Kaleidoscope Abelia generally averages around 4 feet tall, those living in the warmest sections of its hardiness range can usually expect taller plants. In zones 8 and 9 where winter temperatures are consistently warm, it isn’t unusual for the shrub to grow arching branches that are 6 feet in length. Kaleidoscope Abelia makes a useful small-growing shrub used in a variety of locations in the landscape. With its colorful foliage, the Abelia makes a stunning specimen or can be grouped together in mass plantings. Whichever way you use it, it’s sure to get the eye’s attention. 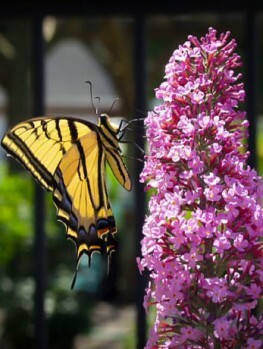 Plant the shrub in containers and place on a porch or entranceway, so its beauty and scented flowers can be appreciated. If you have an erosion problem in your landscape, Kaleidoscope Abelia helps solve the problem when planted on slopes where soil can naturally wash away. 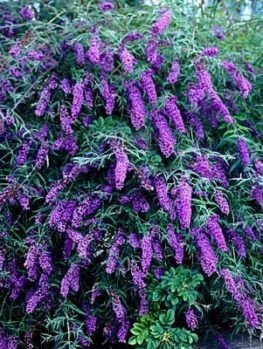 The shrub is resistant to deer damage, but it makes a great addition to wildlife gardens as the flowers attract both butterflies and hummingbirds. It works well used as an informal hedge with its long, arching branches allowed to flow naturally. Kaleidoscope Abelia’s shorter growth makes it suitable used as a low-growing ground cover or used to line borders or pathways in the garden. Wherever and however you decide to use it, Kaleidoscope Abelia will pump up the color and fragrance to your garden. When contemplating where to plant your Kaleidoscope Abelia, always consider its mature width, when utilizing multiple plants so they have room to spread. It tolerates growing in a location receiving full sun or partial shade; although you will get the most elaborate foliage color on plants grown in a sunny location. For the best growth, plant in rich, acidic soils that drain well. 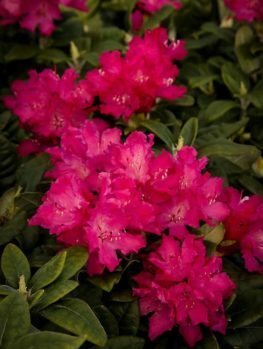 Although the shrub is relatively tolerant to drought conditions once established, especially in its northern location, give it a deep watering once to twice weekly for its first year of growth and while the root system establishes itself into the planting site. Even after established, if you live in a hot and dry climate, you might have to continue watering deeply once each week. If you are growing it in containers, check the top inch of soil and if it feels dry water until it runs from the pot’s bottom drain holes. In 1997, Randy Lindsey of Locust, North Carolina discovered a branch of Kaleidoscope growing on one plant of Abelia x grandiflora ‘Little Richard,’ which is a non-variegated selection of Abelia. This one tiny branch started the entire selection of Kaleidoscope Abelia and the plant received a U.S. Plant Patent in July 15, 2006. The three other Abelia selections that are closest in comparison to Kaleidoscope are Abelia x grandiflora ‘Sunrise,’ Abelia x grandiflora ‘Conti,’ and Abelia x grandiflora x Abelia chinesis ‘Mardi Gras.’ The major difference is the three similar Abelia leaves are predominately green, with white or yellow-cream margins and do not have the fiery orange and red colorations during the fall. Our Kaleidoscope Abelia shrubs are grown their entire life in containers in a nursery environment where they are given the upmost care. 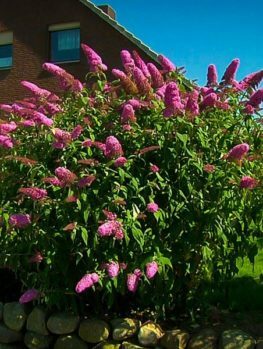 This produces healthy and hardy shrubs that journey to your landscape producing carefree and problem-free growth for years to come.